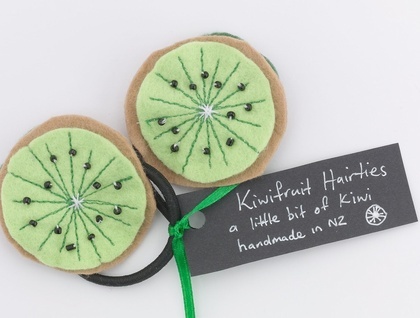 These fun hairties are a little piece of kiwi for your hair! Made from felt, stitched and then embellished with black seed beads they really are a little slice of kiwi. The reverse side of the kiwi is brown felt skin with dark green felt kiwifruit leaves securely attached to sturdy hairties. They make a great little gift for the girl in your life; young or youthful ;-) and are perfect for sending overseas, they are lightweight and loved by homesick kiwis everywhere. This listing is for one set of two matching hairties. kiwi size approx 6cm across including hairtie.